Here is a little example of something I haven’t seen happen in Sweden yet- people not returning their shopping carts. And let me tell you Americans how amazing this idea is! In order to get a shopping cart, you have to put in 5-10 krona (so about $1), and then return the cart to get your krona back. Not a lot of money, but I have never seen a shopping cart in the middle of the parking lot in Sweden! Makes it much easier to park- never worrying about swinging into a parking spot and having a cart be there. This lovely photo was taken yesterday when I was running errands. 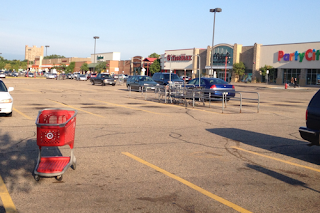 Yes, Americans actually are THAT lazy where they won’t walk the maybe 15 steps to the cart return- instead, carts are just left anywhere.